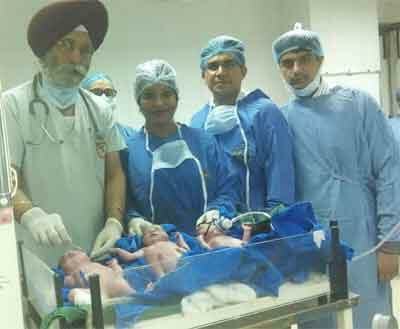 Jalandhar: At PIMS, Doctors from gynaecologist department conducted a complex and risky operation of pregnancy and made it successful by saving the life of both mother and babies. Despite all complications the mother gave birth to triplets-a baby boy and two baby girls. PIMS gynae department, Dr. H.K. Cheema (Associate Professor, PIMS) and her team shared the story of 26 years, Ancy w/o Rakesh Kumar who was earlier facing difficulty in conceiving pregnancy. After her treatment from PIMS she was able to conceive. Doctors informed that the mother was suffering from high blood sugar level and high blood pressure. The weight of the baby boy is 2000 gms whereas of both the girls is 2100 gms at the time of birth. The time gap between the births of triplets was 1 min. Also, there was no need arising to keep the babies in machine. Dr Kanwaljit Singh (Resident Director PIMS) informed that the mother and the children are in best of their health and are offered proper medical care. The doctor at PIMS said that the women after surgery must ensure adequate nutritional diet intake full of vitamin, calories and proteins. Green vegetables and fruits are beneficial for both the mother and the babies. The women must get themselves examined by the doctor from time to time.